Know Your Narrator in Windows Operating System. | Kanishk's Technical Blog. 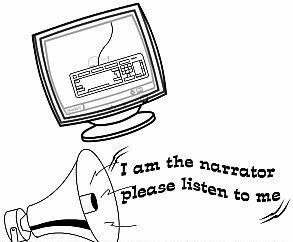 Know Your Narrator in Windows Operating System. Hello Friends, Today I'll tell you how you can see if your computer is a Man of Women.We'll know it from Windows Narrator through which you can give commands to your computer by just speaking out words.Windows Narrator is easy to configure and easy to use if you have a Microphone. Narrator is a light-duty screen reader utility included in Microsoft Windows. When was the first Windows OS with Narrator introduced? The first Windows OS with Narrator was Introduced in Windows 2000. Windows 2000 was the first Microsoft operating system released with some degree of accessibility for the blind built in, permitting a blind person to walk up to any such computer and make some use of it immediately. Narrator can assist a blind person in installing a full-function screen reader, assisting the user until his/her screen reader of choice is up and running. As well, because Narrator is a lightweight screen reader that requires minimal "hooks" into the operating system, Narrator can provide speech when a full-function screen reader might be unable to do so, such as during the process of updating hardware drivers. SAPI is Speech Application Program Interface [Microsoft].